Wow, January crept up rather quickly - hope you all had a great Christmas and a peaceful New Year. Here's an easy recipe for mushroom lovers, which can be prepared ahead of time and just thrown into the oven to cook. 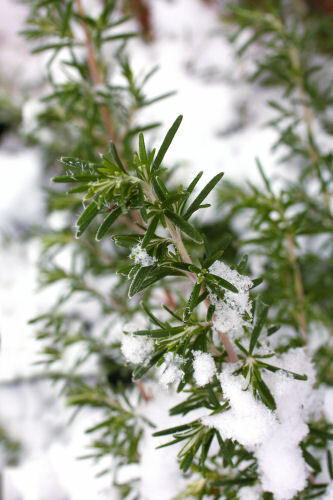 If you don't like chilli you can leave it out, the herbs can be swapped for whatever you prefer. I used portabellini mushrooms, which are smaller than the large portabella mushrooms, but you could use any flat mushrooms for this recipe. Amounts are just a guide. Serves 3-4 as a side dish, depending on the amount and size of the mushrooms. Pre-heat the oven to 180ºC and line a baking tray with foil. Clean the mushrooms carefully and peel off the skins, I like to cut the stalks down. Place them into the baking dish. Cut the garlic finely or use a garlic press and spread a little onto each mushroom. 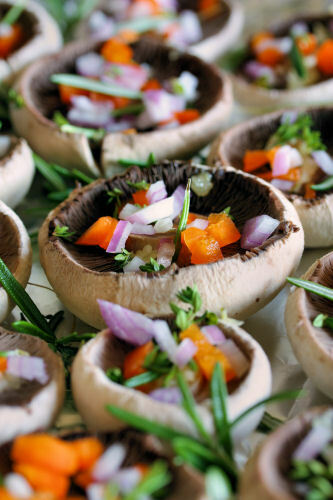 Sprinkle the onion, bell pepper, chilli pepper and herbs onto the mushrooms. Put a few of the herbs under and around the mushrooms. 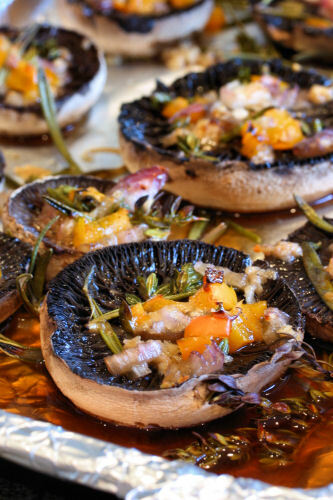 Sprinkle a little sherry onto each mushroom and drizzle with a little olive oil or butter. Bake for about 20 minutes and serve hot. I'm sending this to the Herbs on Saturday event, hosted this month by Vanesther at Bangers and Mash, for more details of the challenge and to see who is hosting each month, pop over to Lavender and Lovage. This is also my contribution to the “Simple and in Season” monthly event held by Ren at Fabulicious Food. Oh yes, I love roasted mushrooms and your recipe with chilli sounds right up my street! 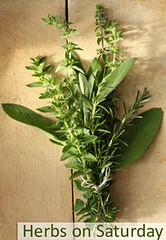 A great entry for this month's Herbs on Saturday. Thanks so much for taking part. what pretty little cups, both before and after roasting! I'm always looking for different veg to serve as a side order. This looks really good especially with the addition of sherry and rosemary. Delicious! Hi Nic You made your mushrooms look very pretty! I adore mushrooms, and baked like this even more! mm! Oh that looks fantastic - so light yet so tasty!